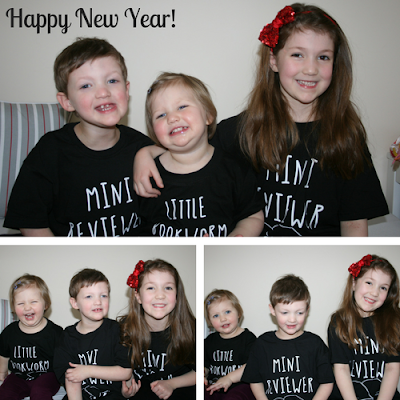 Hello and Happy New Year! 2017 was a fantastic year for us as a family and also for children's literature! We enjoyed discovering so many amazing books and have already been checking out the new releases lined up for 2018. We can't wait to share a few of the books we are most looking forward to reading this year. However, before we do, here are the Mini Reviewers' favourite books of 2017. Now with all the stories we read, you may think it would be quite tricky to choose just one each but apparently this is not the case for the Mini Reviewers, here are their FIRM favourite books of 2017. Izzie (6): The Isadora Moon series written and illustrated by Harriet Muncaster and published by OUP. 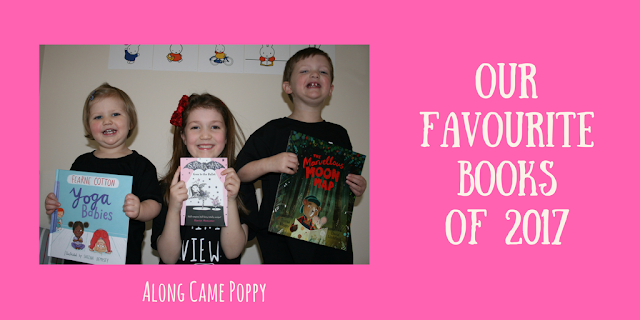 This will come as absolutely no surprise to our regular readers, as we previously posted about Izzie's love of Isadora Moon and how she was lucky enough to meet Harriet in October. You can read our original post here. "I liked the story because there was a school trip and they were going to see a dancing show called Alice in Wonderland. I really liked the dancer that pretended to be a rabbit. I also liked Pink Rabbit because he danced in the show!" She didn't mention the illustrations but there are two double spreads of the dancers that are particularly playful and when we were reading the story, she adored them. The next Isadora Moon book is due to be released in March 2018 and it is at the top of our wish list! Theo (3): The Marvellous Moon Map written by Teresa Heapy, illustrated by David Litchfield and published by Penguin. Theo's enthusiasm for this simple story of friendship is unwavering. Since the first time we read it together, he has asked for it over and over again. It even inspired him to make his own Moon Map and paper boat! 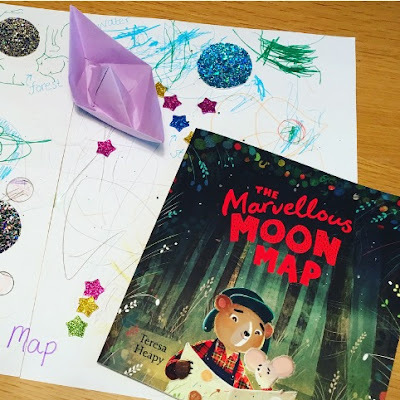 In the story mouse wants to travel to the moon and he is sure that all he needs is his Marvellous Moon Map. However, in the dark woods he soon realises that his map is not enough. Fortunately his good friend bear has already realised this and has followed mouse to the woods, he tells mouse that "... I've got you, and you've got me - so we'll be all right." The story is written beautifully and at times it seems almost poetic and the illustrations by David Lichfield are truly stunning but very simply put here's why Theo enjoys this story so much:"I like bear helping mouse in the dark!" Poppy (2): Yoga Babies written by Fearne Cotton, illustrated by Sheena Dempsey and published by Andersen Press. Since turning two Poppy has discovered her voice and especially the word "No!" Therefore if there is anything she doesn't want to wear, eat, sing or read, we soon know about it. She has also moved to her big girl bed, insists on using the toilet (sometimes) and can be often found running around in just a vest and nappy! 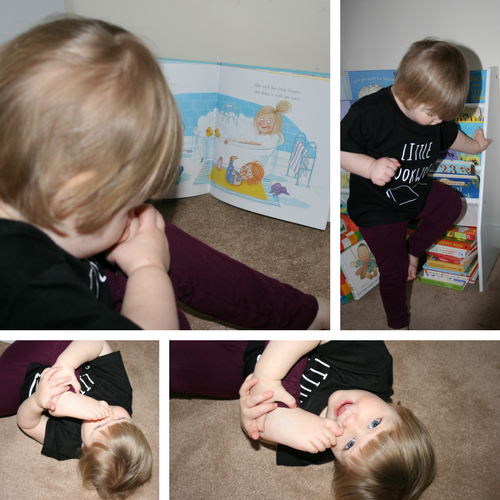 She certainly knows her own mind and this fun book is currently the one she engages with the most. We can't blame her, it's a beautifully illustrated story showing children in everyday situations enjoying yoga with their family, friends and even their pets! So there are the Mini Reviewers' top reads for 2017. We will be discussing our most anticipated books of 2018 with Kim from Bookbairn and other book lovers on Twitter this Sunday (7th January) at 8pm do join us!